The University of Montpellier 3 has issued a call for papers on its first international symposium on “Cross-cultural encounter as a mediatic enterprise.” The November 2018 in Paris event focuses on Japan’s first embassy to Europe (1582-1590) and subsequent publication of De missione legatorum iaponensium ad Romanam curiam. 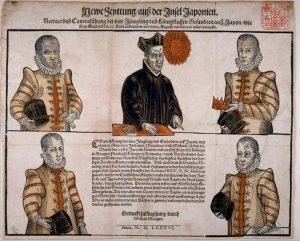 After his arrival in Japan in 1579, Alessandro Valignano, visitor of the Society of Jesus to the region, sent four young Japanese men to Europe in order to, in the words for the symposium’s call, demonstrate the “importance of Japan’s mission to the Pope.” Their travels lasted eight years, covering “Portugal, Spain and Italy, with a final stop at the Roman Curia.” The men’s notes of their European visit become the basis of a book Valignano published for Japanese seminarians in 1590. 5. Criticism: the reception of the work in Europe and Japan, in the history of failed or successful encounters between Japan and the non-Japanese world, as well as in the arts (painting, theatre, literature, sacred writings). A full call for papers is available here.